The most awaited effect for Muse responsive is here! The first Muse Widget that brings back parallax backgrounds to Muse Responsive! Insert real responsive parallax backgrounds into your Muse Project with our responsive parallax backgrounds Muse Widget. Use the widget to create any type of an image you want. The widget is fully responsive and it works in full width, as a regular fixed image and as a responsive custom width image. The parallax effect in this widget will let you set the motion speed of your parallax image to any speed you want, from moving as the rest of the page content to completely not moving and everything in between. And the parallax effect is so somooth that you website will instantly get that professional edge. Responsive Parallax Muse widget works on all devices! so feel free to focus on design and let the widget do all the heavy lifting. You can add custom pattern overlays, see live demo. You are not limited to built in patterns so you can let your creativity run wild and combine your Muse responsive parallax image with a stylish pattern overlay to completely adapt it to your site. NEW! 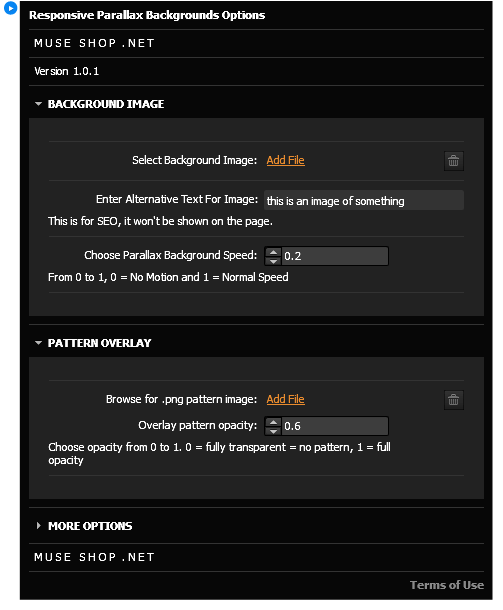 Responsive Parallax Muse Images Color Effects built-in! You heard it correct, the responsive parallax Muse widget comes with powerful image color processing effects. Choose one of the 30+ amazing image color processing effects and instantly turn your parallax Muse images into pieces of art and adjust your images to visually compliment your website styling. You can add a custom border to your parallax images and style the borders to give them that last fine touch. The first widget that brings back parallax effects to the new Muse. The widget is broken when using Safari or iOS device. MuseShop says they have an update, but have yet to release it. Until then, this widget is unusable as iOS is such a major platform and can’t be avoided. Hi Brian, we will be releasing an update to this widget tomorrow. Please check the widget when updated and consider the rating once we release the update. Thanks for the update, all good now! I was hoping it will work with graphic elements too (slideshow and so on…). Is it possible to make widget like that? Responsive & Parallax together in Muse Responsive! *Apple iOS devices not supported, regular image will be used instead.